Skyproc patcher for Enderal to fix mod added armor from Skyrim being invisible. Works with ALL custom armor. This patcher for Enderal will add the two races Half Arazealean (FormID: 033899) and Half Qyranian (FormID: 033898) to mod added armor addons. Without doing this custom armor from Skyrim is invisible when equipped for these two races. To obtain the armor ingame you still either need the console or a mod like AddItemMenu. Please note that you should rerun the patcher if you remove/add any custom armors to Enderal. The patcher does the same thing as Making Armor and Body Replacers work for Enderal but in automated fashion. This mod should work with ANY setup and any other mod. Only case you should be careful is if you have mods in your load order which add/modify Enderal creatures. While nothing should go wrong better play it safe and add those mods to the blocklist.txt: Add the mod's .esp file name to "SkyProc Patchers\EnderalAAPatcher\Files\Blocklist.txt". Use NMM, Mod Organizer or Wrye Bash to install. If you are familiar with Skyrim's/Enderal's folder structure you can install manually of course. Run the included "EnderalAAPatcher.jar" in: "Data\SkyProc Patchers\EnderalAAPatcher". Configure the patcher as you please. 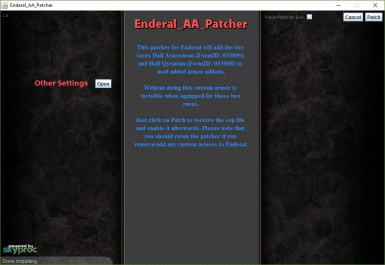 Check the created "Enderal_AA_Patcher.esp" in your launcher. If the "Enderal_AA_Patcher.esp" is not at the end of your load order, then move it there yourself and rerun the patcher! Uninstallation is safe at any time. No scripts, no leftovers ingame. Uncheck & delete the "Enderal_AA_Patcher.esp" in your launcher. Then either use your mod manager for uninstallation. Or remove the folder "EnderalAAPatcher" in "Data\SkyProc Patchers\". While the patcher is very limited in its scope, I wouldn't mind adding more fixes to Enderal in a procedural (i.e. skyproc patcher) way. If you have any suggestions, let me know! Generally every update of the patcher is safe to overwrite the previous version with. However, you should always rerun the patcher after upgrading to benefit from bug fixes and new features. Do not redistribute this file or any part of it. Exclusive to the Nexus. This mod comes without any guarantees that it will work or leave your game/computer intact. Use at your own risk.